Andrew McKenna is one of Chicago’s premier businessmen and a member of the Irish America Hall of Fame. 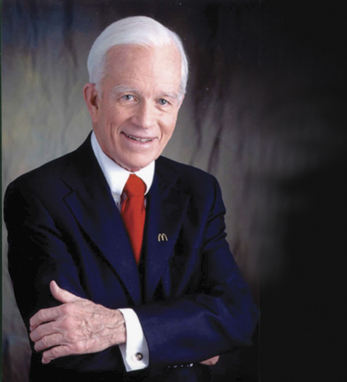 Currently, he serves as chairman of McDonald’s Corporation and Schwarz Supply Source, a position he has held since 1964. He is also a director of Ryan Specialty Group, McDonald’s Corporation, and the Chicago Bears Football Club. The father of seven and grandfather of 24, Andrew is a native Chicagoan who himself is one of six children. His father, Andrew J. McKenna, Sr., was a first-generation Irish American, with roots in Mayo and Monaghan. In addition to his private sector positions, he is a director of Lurie Children’s Hospital of Chicago, The Ireland Economic Advisory Board, the Lyric Opera of Chicago, and Metropolis Strategies, among others. A graduate of the University of Notre Dame with a B.S. in business administration, Andrew was awarded the university’s Laetare Medal in 2000. He served as the chairman of the board of trustees from 1992-2000 and continues on the board today. He is a graduate of the DePaul University Law School where he received his J.D.